Banjara is a gypsy community of India whose population is concentrated in Telangana. These are nomadic tribes who move in groups from one region to the other and get exposed to peculiar lifestyle. Despite of being nomads, they have a unique aesthetic sense which emerged into a wonderful needle craft and embroidery work. These tribesmen have contributed in their own way to the development of art and culture of the region. Banjaras of Hyderabad is one of the social groups of India whose population is gradually diminishing. Needle and embroidery work is a form of craft where the Banjaras use simple needles, embroidery threads and base fabrics and transform these into beautiful art pieces which look too ethnic. These art pieces reflect their colorful lifestyle. Though the embroidery work and mirror work of Banjaras look similar to Kutch work of Gujarat, yet it is markedly different and its own style. 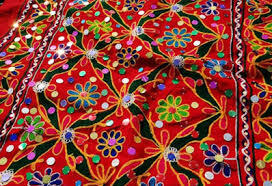 Banjaras do the needle work with colorful embroidery threads on a piece of cloth. They use mirrors, shells, beads etc and make magical creations with their hands. Their work is unique in its own way which has gained much popularly in the recent times. They use mirrors extensively which is a distinct feature of Banjaras work. They fill up the background of the fabric with simple chain stitch using colorful embroidery threads. 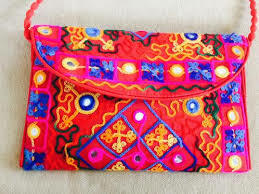 Some of the Banjara items which have gained popularity are the cushion covers, bags, kurtis, blouse pieces, bedspreads, mobile phone pouches and many more. The govt taking all necessary actions to revitalize the art by improving the quality and standard of work by providing the Banjara with better raw materials. The govit is also providing market promotion to the works of Banjaras. Banjara is a popular Indian tribe that has its origin in the North. The tribes moved to the Deccan plateau in the medieval period. The tribes spread over in this region and started living in small villages known as 'tandas'. 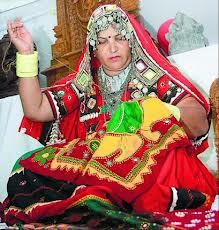 The Banjara women wear special costume with attractive tribal jewelry. They wear gorgeous lehenga, chole and odnis that are heavily embroidered with mirror and applique work. These days, Banjara women are also engaged in labor work like road construction etc. Even when they are engaged in labor work, these women come with their typical costume to the ground. Banjara products can be bought from the govt run Lepakshi Emporium across the world. The price depends on the work and make of the product.